With Verbatim's 4200mAh Ultra-Slim Power Packs, you can talk longer, listen to more music, play more games, and watch more videos without worrying about running out of battery life! Lightweight and slim, the Verbatim 4200mAh Power Pack fits easily into a pocket or bag. Use the Power Pack to charge a wide range of devices including iPhones, iPods, eReaders and Micro USB charged phones or Bluetooth headsets. Available in a variety of vibrant colors, a full charge provides up to 2 full iPhone charges, or similar for Smartphones with an average 1400mAh battery life. Included USB cable charges micro-USB devices and can also be used to recharge the Power Pack when not in use. To charge your iPhone/iPod with the Power Pack, simply use the data cable you received with your device. Measurable Power - Know the status! LED status indicator lets you know how much charge time remains on your Power Pack. A convenient on/off switch lets you turn off the device when not in use to save battery life. Choose a portable power solution that reflects your personality and style. 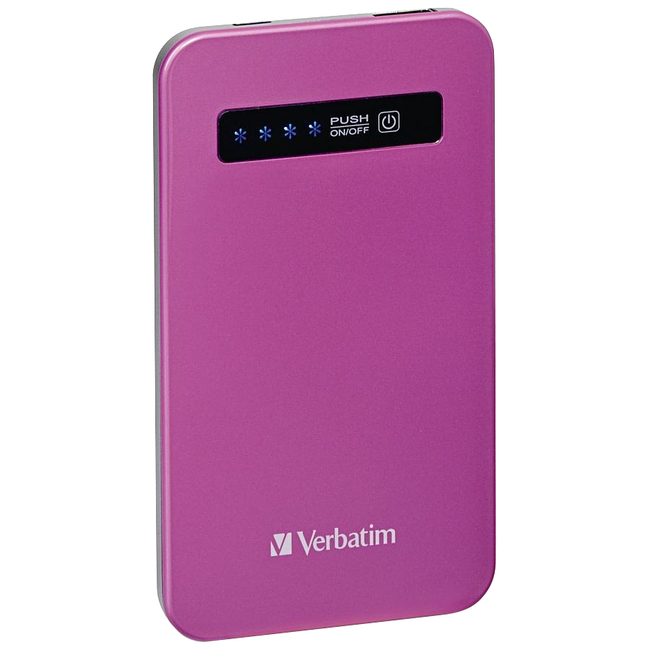 Verbatim Ultra-Slim Power Packs are available in a variety of vibrant, stylish colors, including: red, cobalt blue, aqua blue, white, black and pink. Based on iPhone 4s and iPhone 5/5S. Use time will vary with device being charged.